Today I feel like ranting about games, specifically RPGs. A lot of RPGs involve a balance between 2 things, Story and Gameplay, as you know, but there is also another balance within gameplay itself: Introduction of new game mechanics, and using them. The reason why I'm phrasing it like that is so the following examples and comparisons may make more sense maybe. The introduction of gameplay mechanics in RPGs generally fall into new areas, enemies, skills etc. - basically new content to make the game interesting. Using them, or playing around with them - as is the point of a game - often falls into the usage of what you know to fight enemies, solve puzzles and whatnot. 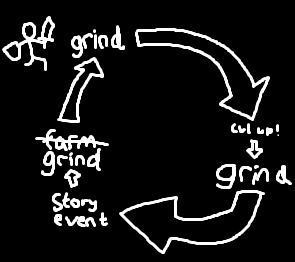 However, a lot of games then fall into the grinding as a means of increasing game time, which is not cool. This is what happens when you have too much of making the player use the abilities they have repetitively. A common example is the standard JRPG. A while back I played Final Fantasy Four Heroes of Light, which I played with a x16 exp modifier in order to be the correct level to fight a boss after fully cleared run through a dungeon. Which is frankly, ridiculous. I eventually got bored of the game because it was too much of a grind. I stopped near the end simply because it offered more of the same - the final dungeon looked exactly the same as an earlier one but palette swapped and several levels longer, as well as having the same enemies sporting a new coat and higher level. Much of it felt recycled and I just couldn't be asked. Even the Ice Cavern had an interesting change when it introduced a puzzle to access the boss room. Admittedly it was really easy, but at least it had one. I probably wouldn't have played any longer than the intro without the exp modifier cheats because of the simple fact that the relatively standard storyline plot events are so far apart in terms of gameplay time between them that by the time I finished a dungeon I couldn't remember what the guy back at the village wanted me to do in the dungeon to begin with. This is a case where there is too much imbalance, and a lot of the game becomes a Microsoft Excel fill out the numbers on a sheet for extra pudding between A and B, very counter-productive to a genre where story telling is a very important aspect of keeping the player playing, since a lot of RPGs certainly never introduce new content like other party members with any great haste to keep the game interesting from a gameplay point of view. By far my favourite part of the game was receiving a staff which could change the main characters back and forth between being animals, simply because it made the game much more hilarious having a ragtag dog, cat, cockerel and bunny beating up ancient evils like no one's business. Of course one could argue that that game is an egregious example, being a throwback to the old JRPGs where grinding was the only easy way to increase game time, but the concept is still ever present up to this day in a lot of games. It's why I appreciate hack and slash games a whole lot more, since the new content can come in at almost anytime as you discovering a new combo, receiving a new kickass skill, or just finding out that you can pick up that enemy and throw them at another enemy for fun times. Another game I played was Fortune Summoners, but that also suffered from a large amount of fall-off when it too became a grind, despite being a hack and slash 2D platformer, a gamestyle I quite like. It does this by giving you levels which are required for new techniques, skills, combos etc. which on its own isn't bad, but when the game is developed in Japan, it becomes a let's run into a dungeon and hit things until they die then run away, heal up, rinse and repeat until I am a high enough level to fight the enemies in a dungeon properly without losing all my health in one hit because they are slightly higher level. Of course it wasn't helped by the fact that the new overpowered skills I was designated to receive next was in just 2 levels, but unfortunately, exp rewards at this point were so low it I never got it. In fact let's just say I don't like games where levels = win by numbers. Or games where THE BESTEST EQUIPMANT EVAR also make you win by virtue of ridiculous bonus numbers. But anyway, before you think I only rant about bad things, here's an example of a game I think provides a good balance between the three points I've talked about: Portal. Simply because of the system it adopts which is telling the story as you play, giving you new gameplay mechanics - toys if you will - and letting you play with them. Then introducing you to further use of these mechanics and letting you analyse and combine what you've learnt with what you know already. That was cool. Also now a rant about something completely unrelated to the above rant: Portal had a theme of here is your puzzle. It is a large room so you can see everything, those are your toys, there's the exit. Portal 2 introduced too many sequence breaking mechanics and thus had to prevent players from insta-winning by making every surface unable to have a portal placed on it. This made puzzles longer, as it becomes a hunt for where you can place a portal on a surface. This is bad because the idea behind leaving a portalable surface everywhere in Portal 1 meant you could mess around in the test chamber until you where inspired for a solution by the antics you randomly tried. Portal 2 had almost none of this, almost directly stating THERE IS ONLY ONE SOLUTION HERE IS THE PUZZLE FILL IN THE BLANKS, unlike the more free and understandable levels of Portal 1. Don't get me wrong though, both games where great. Anyway.